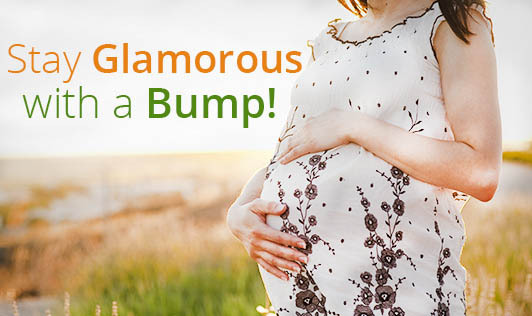 Stay glamorous with a bump! Tone down your makeup to let your hormones do the talking. Keep your skin moisturized; use a sunscreen when you go out. Get a simple hairstyle, easy to maintain, but it should suit your glowing face. Hair grows faster during pregnancy; you'll benefit from the pampering. It is always a good option to avoid hair dyes. Thank your hormones for a natural boost in beauty. You probably don't need as much color as you normally use, as hormones are giving you a natural radiance. If you feel that your skin is getting too dry or blotchy, a little bit of makeup might help you feel better about your appearance. Your make up routine should be something simple. When selecting makeup, be sure that your skin can tolerate it. Making small, flattering changes can make you feel great. You are lucky to be pregnant at a time when maternity clothing is in trend. Stick to flattering necklines, colors which compliment your skin tone, and waistlines which you are comfortable wearing. Just because you are pregnant, you do not have to give up on your personal style. Shop wisely. Buy easy to maintain items which are made to last. When shopping for maternity wear, buy your true size. If you're normally a small, buy maternity small. If you're normally a large, buy maternity large, and not plus sizes. Buy mix and match clothing to "expand" your wardrobe options. Clothes that fit properly are more flattering than clothes that are too tight or very large. If you look good on the outside, you feel good inside; which gives you an added confidence.